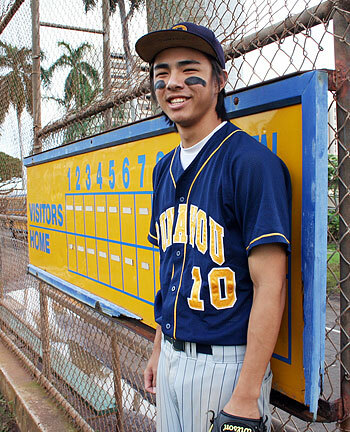 When he's not pitching, Punahou's Scott Hiramoto plays left field. He's 2-0 on the mound, and he's a threat at the plate. HIS ALL-STATE cousin wore it. His All-State sister wore it. Now it's his turn. For Punahou senior hurler Scott Hiramoto, donning the No. 10 jersey for the second-ranked Buffanblu baseball team is like carrying on a family legacy. "I picked it, too, because he had it," Hiramoto said of wanting to wear No. 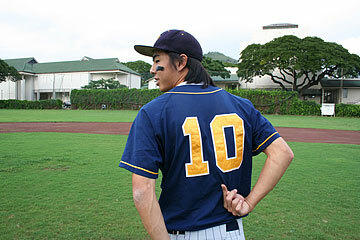 10, the same number worn by his cousin, Jared Pate, and sister, Lauren Hiramoto, while they played at Punahou. Shortly after the Buffanblu claimed the state tournament title last year, Hiramoto asked his cousin, former Punahou ace Pate, if he could take his jersey number. Pate, who had just finished pitching a two-hitter to win the state title, agreed. In a graduation thank-you card to Scott, Pate wrote at the bottom, "I'm going to have to leave No. 10 for you to keep the tradition going." "It was cute," Lauren said. As a 2001 All-State honorable mention softball player during her senior year at Punahou, Lauren was the first in the family to wear No. 10. A four-year starter on the Buffanblu softball team, Lauren went on to play for Loyola Marymount until her graduation last year. "She always made me want to wear (No. 10)," Scott said. EACH STARTING OUT with baseball in the first grade, Scott and Lauren both have their father to thank for getting them started in the sport. "My dad's a big baseball, softball freak," Lauren said. "We've been playing our whole lives." "Our lives don't revolve around baseball, but it's a big part," Scott said. "My dad still plays softball, and my mom is very supportive." Now that her playing days have passed, it's Lauren's turn to see her sibling succeed. She takes pride in the fact her brother is living up to all that the number 10 represents. "He's doing so well. I'm really proud of him," she said, adding that her parents often call her in California to give her updates during Scott's games. They have a lot to cheer about. In two games so far this season, Scott Hiramoto is perfect at 2-0, registering both of Punahou's league wins. In both games, he went the full seven innings, allowing a combined two runs on seven hits against Kamehameha and Pac-Five. Punahou's Scott Hiramoto pointed to the number on his jersey, the same No. 10 worn by his cousin and sister. "Pitching is definitely my focus," said Hiramoto, who plays left field when he doesn't pitch. If there is one thing that differentiates Hiramoto from Pate, it's Hiramoto's contributions at the plate. While Pate dominated batters and was named the Star-Bulletin pitcher of the year last season, Hiramoto is a double threat. He can hurt the opposition with his arm and his bat. In the win against the Warriors, Hiramoto went 2-for-4 with a double. And while he pitched the Buffanblu past the Wolfpack, he also drove in two of Punahou's nine runs. BUT HIRAMOTO, WHO appeared mainly as a reliever last season, knows that where he really helps his team is from the mound, especially with Pate now at UC Irvine. "He anchored our whole pitching staff for the past two, three years," Hiramoto said. "It's left a big hole. "But as a whole, our whole pitching staff has been playing pretty well." As a junior in 2004, Pate was named the Star-Bulletin's Player of the Year after leading the Buffanblu to their first state baseball title in 15 years. "For everybody, he set the bar high. Very, very high," Hiramoto said. "He gave everybody something to strive for. Everybody wants to have a reputation like he had." Last season, hitters in the Interscholastic League of Honolulu were already taking notice of Hiramoto, who was an ILH honorable mention pick. Other than a nice tradition he wanted to carry on, Hiramoto said the No. 10 jersey doesn't really stand for anything. But as Hiramoto continues to rack up wins and RBIs, that number, in bold blue and gold, will represent more than just another spot on the roster.